Construction of the overpass is expected to begin late summer and last about a year. 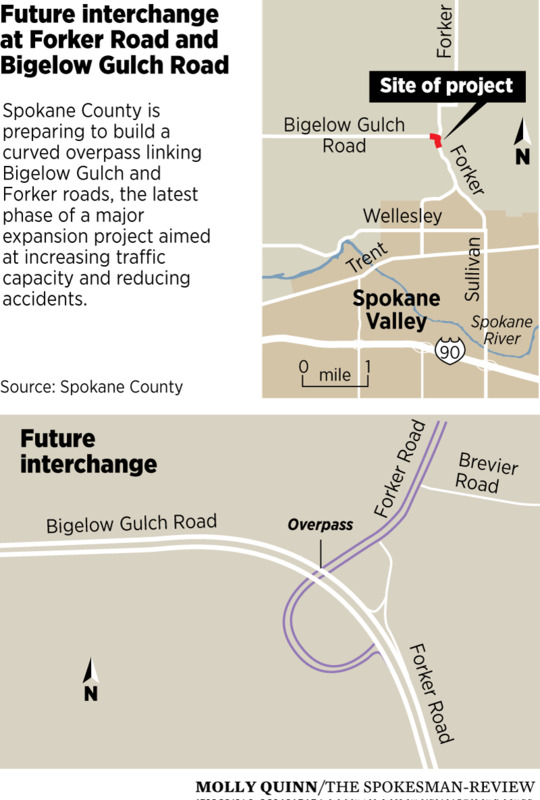 It will replace a blind curve where Forker intersects Bigelow Gulch. The broader expansion of the Bigelow Gulch/Forker corridor, from Havana Street on the west to Progress Road on the east, is expected to last through 2020 or 2021, depending on grant funding, said county spokeswoman Martha Lou Wheatley-Billeter. “It really is a mammoth project,” she said. The county has already completed two phases of the project – a widening of Bigelow Gulch from Havana Street to Palmer Road, and construction on the Bigelow Gulch/Argonne Road intersection. Next summer, the county will widen the 2.7-mile straightaway between Old Argonne and Evergreen roads. The goal is to make the corridor safer for a growing number of commuters and commercial trucks. Forker sits in a ravine and runs north from Spokane Valley. Bigelow Gulch runs through the Orchard Prairie community and becomes Francis Avenue at Spokane’s eastern city limits. Over the past 20 years, there have been at least 759 crashes on the county-owned sections of Forker and Bigelow Gulch roads. Five of those have been fatal, and 283 resulted in injuries, the county says. The expansion will result in a faster thoroughfare with two lanes in each direction. East of Argonne Road, more than 7,000 vehicles travel the corridor each day, and the county expects average traffic volume to nearly double by 2040. The project has met resistance from many neighbors, particularly those who are losing property to make room for the widened and adjusted roadway. The county commissioners approved a slate of condemnations in January and are expected to sign off on more during their Tuesday afternoon meeting. More than 20 parcels and at least a dozen landowners will be affected. One of his clients, Kristina Brandvold, said the Forker/Bigelow Gulch interchange would affect up to two-thirds of her 6.5-acre property. She worries about the impact it would have on the value of her remaining property, as well as drainage and water quality. “They should be addressing our property as a whole,” she said. The county initially offered her family $26,000 for a strip of land near the roadway. Brandvold and other residents said appraisers hired by the county had based their estimates on other properties that are worth significantly less. Wheatley-Billeter said she understands residents’ concerns, but the county can’t simply offer more than an appraised value for a given piece of land.